One of the things I enjoy about cooking from recipes I find online is that they generally come with user comments or reviews. Whether it's through a personal weblog, Epicurious or AllRecipes, you can usually get a sense of whether something is a tried and true classic, a potential bomb, or simply not worth the ingredients. A recipe alone, untried, is a perilous thing. When you've got a few comments you can usually tell if it's worth making and, more importantly, the pitfalls to watch out for. How else would I have known, after my second flubbed batch of meringue buttercream, that I needed to whip the butter before adding it to the egg whites? How would I have known, in another recipe, that the salt called for was way too much, or that the canned tomatoes should be doubled? In this spirit, every now and then I am going to review recipes that show up in publications that I love to cook from but that do not have this cook and review system built in. One of my favorite places to look for new recipes is the New York Times Dining section. Every week I look forward to Mark Bittman's The Minimalist column; I often find great things there. Here's one from last week, a lamb dish inspired by street vendors - tiny chunks of lamb stir-fried very fast with cumin, soy sauce and cilantro. Deliciously seared bits of meat with crispy outsides and tender middles are the result of just a few minutes' work - good over rice or just plain. One other thing I like is that this can easily be made ahead and left uncooked and sealed in bags in the freezer. The lamb is chopped so fine that it doesn't take long to defrost and hey presto, five minutes later you have a meal. I did adapt the recipe slightly and add some lime juice and peppers to make it saucier and kick up the heat. If you don't like things hot, leave the peppers out. The whole cumin is indispensable - you cannot substitute ground because the cumin here functions like a nut or seed, crunching between the teeth and filling the mouth with warm, toasty flavor. The single drawback to this recipe is that the lamb must be cubed very fine. If it's not chopped into small, even pieces the meat won't cook fast and evenly. I think you may be able to ask the butcher to cube it finely for you, but I haven't tried that yet. I put about half an hour into chopping extra meat and froze it in the marinade. Overall, this recipe was a real winner: delicious, healthy, easy, and make ahead, which make it an A+, five stars and four forks - however you want to score it. I can't find the recipe anywhere to link to - it's not even in the NY Time archives, strangely - so I am putting my adaptation here. Hopefully the New York Times won't sue me. 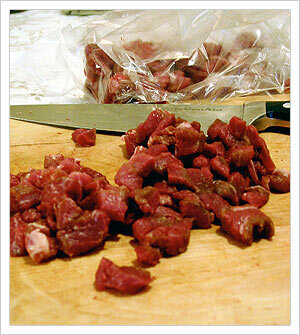 Cut lamb into 1/2-inch cubes (easier if meat is firmed in the freezer for 15 to 45 minutes). 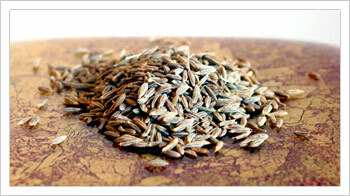 Toast cumin seeds in dry skillet over medium heat, shaking pan occasionally, until fragrant and slightly darkened - a minute or two. 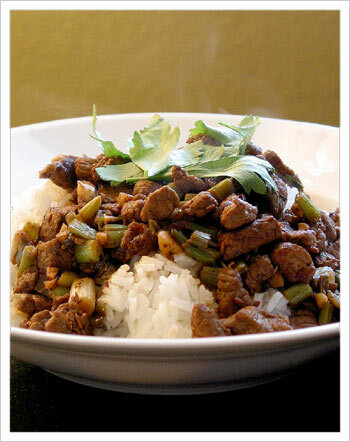 Toss together lamb with cumin, chili, garlic, soy sauce, a large pinch of salt and a healthy grinding of pepper. If you like, cover and refrigerate until ready to cook, up to 24 hours. When ready to cook, put a tablespoon of oil in a large, heavy skillet or wok (ideally, it will hold the lamb in one layer, or nearly so) and turn heat to high. The skillet needs to get as hot as possible, so give it a while. When really hot, add lamb. Cook, undisturbed, for about a minute, then stir once or twice to loosen lamb from skillet. Cook another minute, then stir again. Add scallions and julienned peppers, if using, and cook, stirring occasionally, until scallions glisten and shrink a bit and the meat is about medium. If you want a slightly saucier mixture, stir in 1/4 cup water and the lime juice and cook another minute. Stir in the cilantro just until it has wilted. Serve hot over rice, garnished, if you like, with more cilantro. I have seen and read out all pages as well as all articles and I think your post is exceptionally fascinating and generally, I continue searching for like this sort of sites where I learn or get new idea. so I need to sugguest you one thought you will review the task custom essay writing service and furthermore review the rule of remark. I have to thank you for your minute because of this inconceivable read! A good blog always comes-up with new and energizing data and keeping in mind that understanding I have feel that this blog is truly have all those quality that qualify a blog to be a good one.